Riffing on foods, flavors and methods since...no, that would be telling. 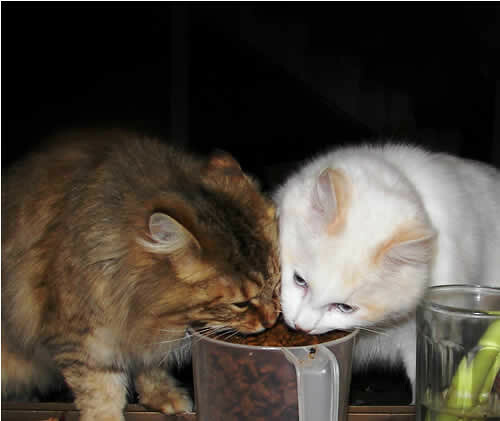 This week I have two visitors for you - two of the feral cats I feed. This is Tortie and Blondie. The darker cat doesn't show it very well in this photo, but she's an all-over tortoiseshell with a tiger stripe. The little blonde cat looked all white at first, but now she's showing some pale orange markings. I don't know if that's a natural effect of maturing, or if it has to do with it being winter with less sun to fade her, or, even, if it's got something to do with having a steady diet for a change. They each have very different personalities. Tortie is a little scrapper, aggressive and will even let me pick her up briefly when she's after food. :G: Blondie is very shy, making big eyes at anything she's unsure of. She never gets close enough to touch, althought I'd love to give her a cuddle. For lots more adorable kitties, drop on over to visit Clare and Kiri at EatStuff for the Weekend Cat Blogging roundup. They are so sweet.... and so good of you to look out for them. How nice that you look out for them...Lucky Cats! Our Dutchie looks a little like the tortie...our Vet has labelled her as a Mackeral Tabby! They're adorable, but I wish I could catch them and take them to be spayed (sp?) before they have kittens. A Mackerel Tabby. Huh. I've never heard that before, but I'll have to remember it. Thanks. They are beautiful, they don't look like ruffians at all!! Hopefully, you can cuddle that white one soon. I can't wait to see the rest of the menagerie! Those kitties are so very lovely. And it's rather sweet that they eat out of the same bowl without clawing each other. That's wonderful!! They are beautiful and so are you for taking care of them. Gigolo Kitty, Blondie gets along with everybody, she's so demure. She eats at the same time as the possum, not from the dish. I usually pour the kibbles out in a long stream, so that more than one critter can eat at a time. Once there was a fox at one end, Blondie in the middle, and a possum at the other end, only about 3 feel altogether. It's the little Tortie who fights with the other cats, and runs away if one of the other animals comes around. I wish they were pets so I didn't have to worry if they're getting enough to eat. I put out leftovers for the possums and foxes, too. I'm a compulsive feeder.